After I got the trailer back to my build site, I looked at it for weeks, not knowing where to even start. Now that I have this trailer, how the heck am I gonna make this thing a livable house? How do I frame this thing? Wood? Aluminum? Steel? Although I had absolutely no experience with metal, the more I evaluated, I felt like the structure needed to keep the same steel frame material. The used trailer I purchased was a custom ATV trailer built in the 90's. It was designed to haul motorcycles and bikes out to the desert, hence the double deck. It was framed using 2x2" 11 gauge square tubing. The original intent was to enclose the existing frame. But after I got the trailer back to my build site, I determined that the existing frame was too small for my needs. The interior roof sat just above 6' and the interior width, just over 7'. I realized if I were to enclose it as so, I would definitely feel cramped. So, I re-framed my thinking and decided to re-frame the trailer, again out of steel. On the first day of the build we cut off the existing frame, leaving the flatbed naked. This first day humbled me to my core - I realized, "oh, s***, what did I just get myself into? Proceeding this first day came months of building back a new frame that would suit my needs. We started by adding 1' to the width, and 3' to the interior ceiling height. Starting anew - my oh s*** moment after we chopped off my original frame. What I thought would take a couple months ended up taking over a year. Why so long? Primarily because I chose to go with a steel frame. I hired a structural welding friend to get me going. For the first couple of months, I got schooled in metalworking basics - sourcing, cutting, grinding, and prepping the metal for my welder. Within about six months of building, I became more confident in working with metal. I took a "Mig" welding class at my local DIY fabrication shop. Then another welder friend moved out the country and gifted me his flux core welding machine. I started slowly and began welding myself. This tiring but thrilling new skill propelled my confidence to keep going with this huge undertaking. 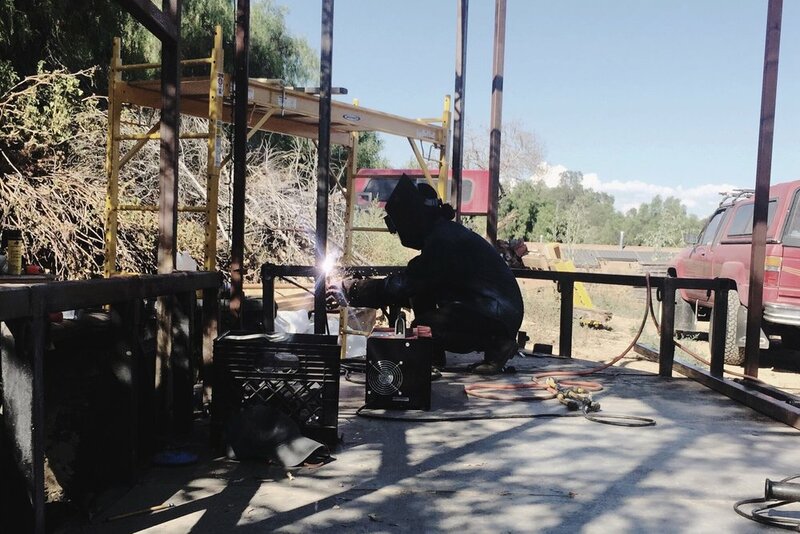 Finally welding on my own!